Mid Michigan Community College (MMCC) employees celebrated “March Is Reading Month” by reading to local 2nd grade students. Numerous MMCC employees visited classrooms across the mid-Michigan area to share the College’s original book “Harry the Heron Spreads His Wings,” featuring MMCC’s mascot. Harry the Heron himself was present during the readings to pantomime the book’s events and to offer up hugs and high fives to students when the story was over. 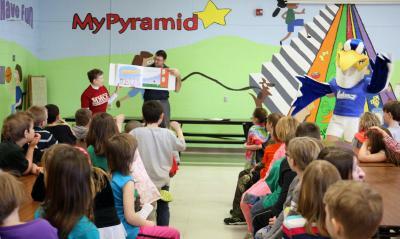 More than 20 local elementary schools, involving nearly 70 2nd grade classes, participated during the month of March. Schools in Clare, Gladwin, Isabella, Gratiot, and Mecosta counties were represented. The original book came to fruition through the talents and efforts of MMCC staff members who generated a storyline, wrote, and illustrated it. It features a young Harry who dislikes all of the ways that he differs from his classmates until he learns that his differences also make him special. Before the end of the school year, MMCC plans to print hardcover copies of the book and donate one to each of the participating school’s libraries. Feedback has been so encouraging that the college will continue the Harry the Heron reading outreach in future years. MMCC is celebrating its 50th year of providing exceptional, affordable, and open-access post-secondary education to the mid-Michigan region. Over that time, the college’s enrollment, program offerings, and scope have experienced tremendous growth. Regardless, MMCC has remained committed to providing personalized attention to its students and to working in direct partnership with area businesses and its local school districts. To read an online version of “Harry the Heron Spreads His Wings,” visit www.midmich.edu/heronstory.